At The Cycle Project, we know it is important for kids to be active and eat well so they can grow up enjoying a healthy lifestyle. However, we also feel that we, as adults, we need to lead by example and live the same active lifestyle we expect of our kids. That’s why we have created the group Tri To Stop Obesity! We want to help adults get out and be that positive motivation. No matter what your ability level (from never done a tri, to seasoned vet) we want you to come train with us and race with us as we raise awareness for childhood obesity. 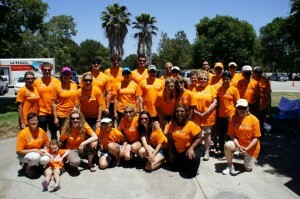 ON JUNE 10, 2012, THE CYCLE PROJECT COMPLETED ITS FIRST TRIATHLON FOR TRI TO STOP OBESITY! 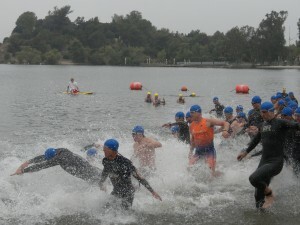 The team consisted of 14 triathletes, 12 of whom had never completed a triathlon before this race. 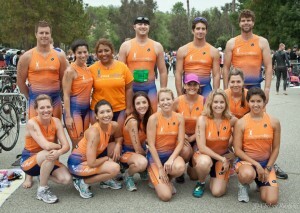 After 4 months of hard work and training every person on the team earned the right to call themselves a triathlete. As their coach, I can’t even express how proud I am of each and every one of them for dedicating all of their time, energy and effort into making themselves the best triathletes they could. Seeing them all together race morning in their team kits, warming up together as a team and then individually crossing the finish line with smiles on their faces was the most rewarding and exciting part of the whole experience for me. We had a lot of family and friends supporting our team at the race, all in orange t-shirts, cheering everyone throughout the course. Seeing all the orange shirts rooting for The Cycle Project as I was out on the course puts this triathlon as my second favorite race out of all the triathlons I have ever done (the first was carrying my daughter across the finish line at my first Ironman). I know the rest of the team appreciated the support and motivation out on the course as well. After the race, the entire team and support crew were able to enjoy a relaxing BBQ as a reward for everyone’s efforts, both competing and cheering throughout the day! I can’t wait to start training for our next triathlon and have new people join our team in these adventures. If thats you, let us know and we will get you started with us! 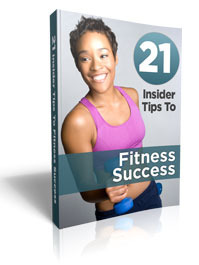 Our next training program starts end of June for our upcoming races! You won’t want to miss this one! If you want to join a great team of friends and triathletes (both beginner and now experienced) train for the next race (Sept 30th or Oct 14th) complete the form below to get more information on how to become a part of an experience you won’t ever forget. Have you ever wanted to complete a triathlon, or perhaps better your time from your previous one? Come join The Cycle Project for our latest adventure “Tri To Stop Obesity”. We are looking for a great group of people to train and compete with us this year in at least 1 triathlon (starting with olympic and sprint distances), while raising awareness for Childhood Obesity. All you need to provide is a positive attitude and enthusiam to complete a triathlon with us. Official Team training will begin Mid-April with races throughout the Summer/Fall. Let us know you’re interested below and we will send you more detailed information about the program.